Beans, beans, the magical breakfast fruit. Beans are at the bottom of the list of things I crave first thing in the morning. But they appear to be an up-and-coming big cat in the breakfast world. In May, Cheerios delivered a protein cereal to the market, adding lentils to those familiar Os to up their protein count to 7 grams for every one-and-one-quarter cup serving. A few months earlier, a lesser-known brand called Love Grown Foods introduced Power O's to its product lineup. The cereal, which does look similar to the Cheerio, racks up 6 grams of protein from a blend of navy beans, lentils and garbanzo beans. A single, large egg boasts the same amount of protein. If nutrition is a concern (which, for a consumer who is interested in buying cereal made from beans, it probably is), Love Grown's version is arguably a better choice compared to Cheerios Protein, which contains upwards of 15 grams of sugar per serving. I'm focusing on Love Grown's Power O's for bean to regular cereal comparison because of their lower-sugar content -- 2 grams in each serving of the original flavor. 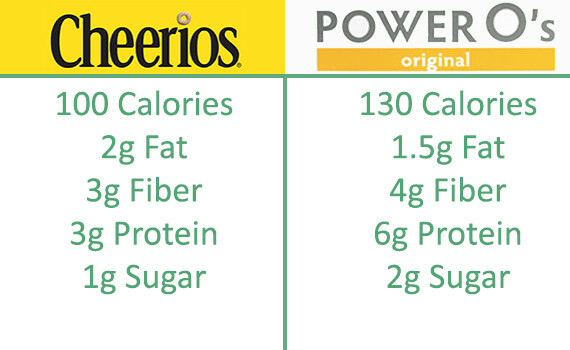 The Power O's also come in honey, strawberry and chocolate flavors, all of which contain 9 grams of sugar per serving. So, why beans? The little plants are often a staple in vegetarian diets for their high protein and fiber count. A half-cup of beans, on average, contains 7 grams of protein -- the same amount as an ounce of chicken (but chicken cereal would be going way too far, right?). The USDA includes them in both the vegetable and protein food groups, making them a truly stellar superfood. Bean-infused cereal doesn't taste as bad as one might think. Love Grown's original flavor is inoffensive and bland -- just like plain Cheerios, but a little less dense in bite. They're crispier. And here's how Love Grown compares to original, plain Cheerios, a box of cereal the whole world knows. Protein has been shown to help build muscle, promote a healthy waistline and keep diners fuller for longer. And even more, those who eat protein in the morning get the benefits of feeling more awake and tend to have fewer tummy grumbles prior to lunch. Health conscious consumers who are sick of Greek yogurt and want to lay off the eggs might be enticed to try a bowl of beans and milk. Children who are exposed to the ingredients before the taste will probably refuse.